Really amazing and will make any event very special - Four foot tall mix & mingle radio controlled character hairy robot dressed to suit the event, rides a three wheeler bike and talks all by remote radio control radio mic transmission from a one man operational team standing nearby with earpiece to receive conversation with the hairy robot radio controlled character. Fees vary according to venue, date and time. Prices subject to VAT, availability, accommodation and transport costs where applicable. Prices include �1 million PL. This life-sized hairy robot is remote-controlled, battery-powered units that ride a tricycle. The mobile hairy robot talks & hears via wireless microphone system and have automatic mouth movement in sync with the sound. The hairy mobile robot head can also be turned by remote-control. The hairy mobile robot can be equipped with various optional accessories such as a voice modifier, a remote-controlled horn, cassette player, water squirter. An array of readily changeable custom animal-like costumes are available. The hairy mobile robot is extremely effective in situations where you want to 'stop traffic'. The radio controlled character makes a lasting impression at trade shows, parades, school's anti-drug safety programs, carnivals, etc.. This highly mobile robot can get anyone's attention by driving up to them (or chasing them down) and starting an interactive conversation. mouth movement is automatically synchronized with the operator's voice. are saying to the hairy robot. approximately a 6 hour run time. Choose Character: Hairy is the standard character. animal character costume you would like. monster, or normal by simply changing a four position switch. This is a belt-pack system. A hairy robot makes a lasting, positive impression on customers. 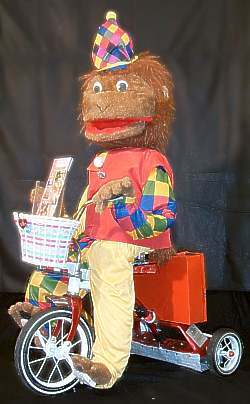 A radio controlled character entertains patrons in an inexpensive, reliable, hassle-free way. Use a hairy robot for your entertainment needs! People of all ages remember unique entertainment -- especially if it's interactive! Unlike people in costumes, using hairy robots for entertainment is unique -- and our hairy robots are interactive. Hairy robots are being used in just about any setting imaginable to entertain people. In restaurants radio controlled characters are used, providing a unique, inexpensive way to amuse people while they wait to be seated or enjoy their meal. Hairy robots can also provide information about menu specials, or make that birthday or anniversary celebration a really special and memorable occasion. In amusement parks and family entertainment centers hairy robots provide that distinctive, fun-filled encounter that everyone remembers. Our hairy robots perform in shopping centres and supermarkets to entertain children while their parents shop -- and kids bring the adults back time and again to visit their favorite attraction. From hairy robots playing Happy Birthday or your favorite '50s rock songs, to mobile robots in furry, cuddly, life-size characters, to hairy clown robots spinning around talking -- hairy robots are entertaining! Mobile Robots are the most effective for entertainment. Nightclubs for in between live bands or full-time!